U.S. Marines with Company E, Battalion Landing Team, 2nd Battalion, 5th Marine Regiment, 31st Marine Expeditionary Unit, 3rd Marine Expeditionary Brigade. Photograph by LCpl Brennan O’Lowney, USMC. 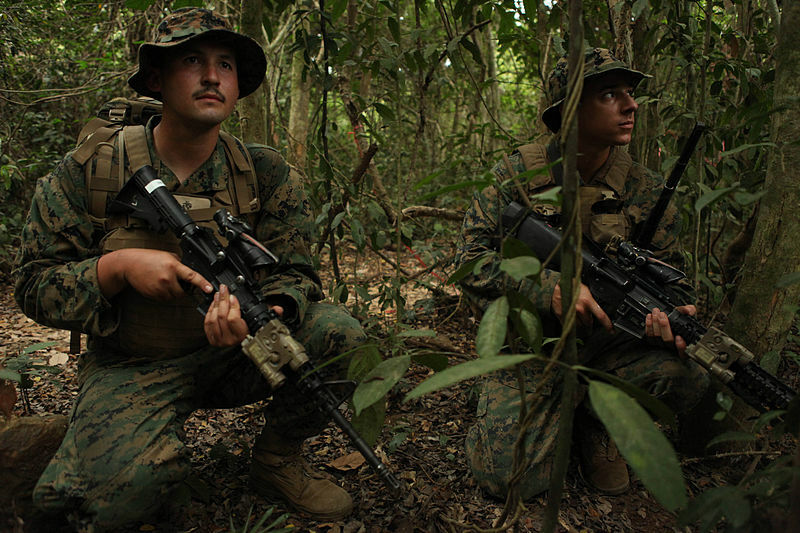 You’re a member of an eight-man recon patrol on a training mission in the Philippine jungles. There’s no real way to exfil as the densely wooded area stretches on for miles and miles. Your team runs into a clearing and takes up defensive positions as your team leader speaks into his radio. In a short while, the thundering of a chopper reaches your ears and you look up to see a gray Navy MH-60S Knighthawk hovering overhead. It’s your only way out, but it can’t land; the clearing isn’t nearly big enough. What now? Special Patrol Insertion/Extraction (or SPIE for short) was created as a means of extracting reconnaissance personnel from areas where a helicopter wouldn’t be able to land due to tight confines or rough terrain. It was developed extensively by Recon Marines in conjunction with with riggers from 1st Marine Air Wing in the early 1970s, building on lessons learned from previous extraction systems used by American special operations forces, especially in Vietnam. The McGuire rig was the first milestone, created by a member of the legendary Military Assistance Command, Vietnam (MACV) to lift one or more soldiers out of the jungle. A soldier would have to sit on a rudimentary saddle, sewn to the end of a 150 ft room and hold onto two straps to keep from falling. The rig was notoriously uncomfortable and difficult for soldiers to get on, thus necessitating a replacement. The STABO (STAbilized BOdy) harness system was the next step, used by the US Army’ s Special Forces in Vietnam. 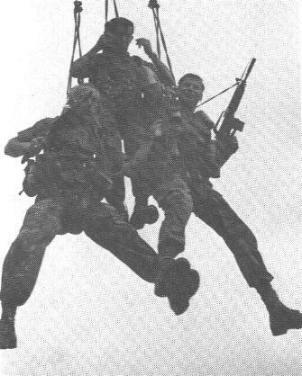 Far more comfortable and considerably safer than the McGuire rig, it involved clipping a body harness to the rope lowered by a helo overhead, then attaching the harness to a number of safety mechanisms which firmly secured the soldier to the rig, leaving his hands free to operate his rifle. The STABO is considered the direct predecessor of the SPIE, which is somewhat simpler in operation. During an extraction, the SPIE rope is lowered by a hovering helo and each individual clips his harness to it and a safety line. Once the team has been secured, the helo slowly moves vertically to clear the rope and its occupants of any high obstructions and is then free to leave the area for a “secure insert zone” where those on the rope are released and either board the helo that toted them around or use another means of transportation to leave the area. During the flight, the rope (and by extension, those attached to it) cannot be hoisted into the helo, so they are treated as an external under-slung cargo; thus, movements of the rope, speed and maneuvering have to be carefully monitored.